House and shop interiors made of wood have a warm, cozy feel, making you feel comfortable and relaxed. Nothing compares to the warmth you feel when walking on wooden floors barefoot. I love the sea and the soothing sound of the crashing waves, but sitting in the mountains or bush surrounded by trees is a different kind of comfort. Trees and greenery have a healing effect and recharge us with a positive energy. The other day, I strolled around the downtown Kobe area for the first time in ages. My friends had never been to Ikuta Shrine, so we went in for a look. I could not resist visiting the sacred forest behind it. Ikuta-no-mori (or what’s left of it) was made famous in Heike Monogatari for its role in the Gempei War. It is so magical, all but a faint hum of engines from the encircling city can be heard. The trees embraced us with their shadows and warmth. 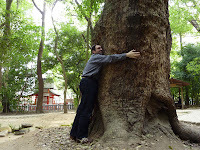 How could I not succumb to the sudden urge to indulge in some tree hugging?